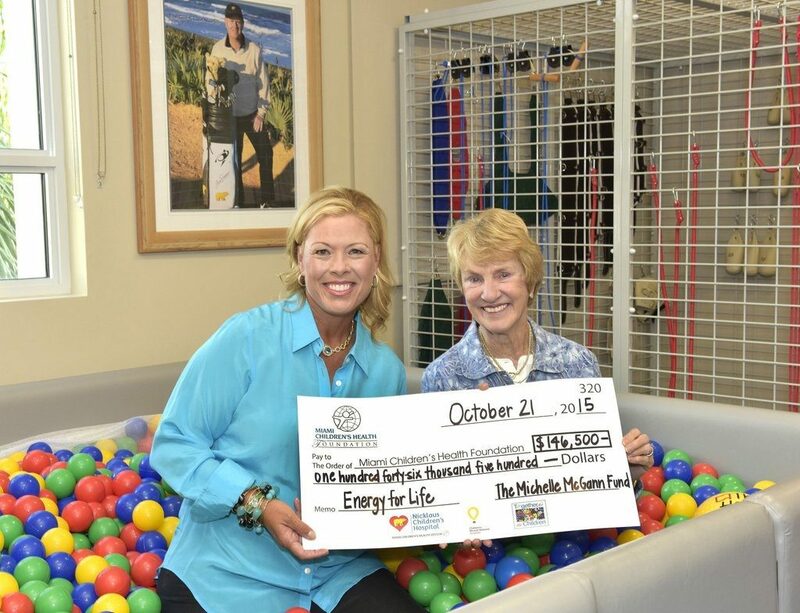 Last week, at Nicklaus Children’s Palm Beach Gardens Outpatient Center at Legacy Place, Michelle McGann presented Barbara Nicklaus, along with the Nicklaus Children’s Health Care Foundation and the Miami Children’s Health Foundation, a check for $146,500 on behalf of The Michelle McGann Fund. The generous donation will directly support a specialized and experienced diabetes nurse educator with in-depth knowledge of childhood diabetes. This position is vital to providing children and their families with the tools needed to better manage their illness. At the age of 13, Michelle McGann was diagnosed with Type 1 diabetes. It is this connection that drives The Michelle McGann Fund’s goal to promote awareness of optimal diabetes treatments and effective disease management so that today’s children become tomorrow’s diabetes success stories. “We can’t thank Michelle enough for her generous donation. Michelle continues to make a difference in the lives of children who, like herself, have been diagnosed with this disease,” said Barbara Nicklaus. With the support of The Michelle McGann Fund, the Outpatient Center can set the standard for care, management, and education for children living with diabetes. The funding will allow the Outpatient Center to offer children with diabetes, and their families, a multidisciplinary team approach to better manage their disease. Miami Children’s Health Foundation (MCH Foundation) is a not-for-profit, 501(c)(3) organization established to support the creation of a world-class pediatric hospital, so no child has to leave South Florida for superior medical care. “Funding World-Class Care” and following the principle that all children deserve state-of-the-art pediatric care, MCH Foundation, now a part of the Miami Children’s Health System, has helped the 289-bed Nicklaus Children’s Hospital become a leader in pediatric health care, with more than 650 attending physicians and over 130 pediatric subspecialists. Currently, MCH Foundation is dedicating all its resources to Together for the Children, The Campaign for Miami Children’s, which aims to raise $150 million by 2017 and help fund priorities such as the expansion of the Emergency Department, construction of a new Advanced Pediatric Care Pavilion, enhancements to its three centers of excellence, and expanding global/telehealth endeavors. Other campaign priorities include research, pediatric outreach, and special programs. Jack and Barbara Nicklaus founded the Nicklaus Children’s Health Care Foundation in 2004 in an effort to provide families with access to world-class pediatric health care in their own communities. Collaborating with pediatric hospitals across the country, the Foundation has made a tremendous impact by supporting innovative programs focused on the diagnosis, treatment, and prevention of childhood illnesses. Nationwide Children’s Hospital and Nicklaus Children’s Hospital (formerly Miami Children’s Hospital) continue to be the main beneficiaries. For more information about the Foundation, please visit nchcf.org.